Have you ever found yourself racing from shop to shop in a last-minute panic to find food, toys, party bags or invitations for your child’s party? Have you ever stared impatiently at the ‘party section’ of your local supermarket thinking that they just don’t have what you want? Have you ever got to the till with an armful of toys, cards and food wishing you’d had more time and choice for your special occasion? If any of this sounds familiar, then you have come to the right place! Any child will tell you that that the party bag is as important as the party itself. 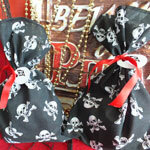 Party Bliss party bags are totally unique and will ensure that you stand out from the crowd and give people a fantastic keepsake to take home. All contents have been tried and tested by our own children before they make it into our bags. Our deluxe exquisitely hand-made fabric party bags are a gift in themselves and can be re-used to store life’s important treasures. An array of colours, fabrics and ribbons are used to complement your party theme. 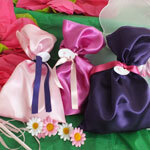 Personalised, filled fabric bags cost £3.70 each. Please advise of any dietary requirements as we also include chocolate treats and gum sweets. 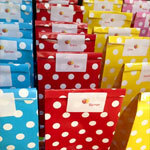 We supply glossy coloured, personalised paper bags sealed with co-ordinating themed name sticker. Filled paper bags cost £2.70 each. Please advise of any dietary requirements as we also include chocolate treats and gum sweets. Whether you are celebrating a wedding, naming ceremony or milestone anniversary, Party Bliss activity bags keep the children busy whilst providing a welcomed distraction during the speeches. 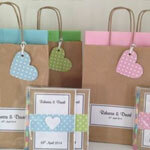 We can even design bags to complement your table colour scheme. Filled activity bags cost £4.80 each. Set your scene from the outset with Party Bliss’ customised, themed unique invitations and add the finishing touch with personalised Thank You cards. We will happily include your own personal message and/or a photograph of the guest/s of honour. Your quality grade cards are enclosed in a colour co-ordinated envelope with the guest’s name printed on the front. The cost of each card is 95p. A perfect reminder of a wonderful day! It is likely that you will be busy preparing food or socialising with parents whilst the children are being entertained and will miss some magical moments. So why not let the Party Hosts take photographs throughout the session on your behalf? Photos include individual close-ups, group shots, cake candle-blowing and reportage shots. A minimum of 25 shots will be sent to you on a CD or USB encapsulating the energy and excitement of the occasion. Please be assured that the photographs taken will not be used by Party Bliss for any purpose without your permission (see our Photography, Images and Media Policy). 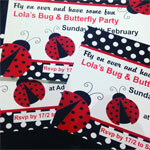 The images will be posted out to you within 10 days of your party. The cost is £20 for a CD or £25 for a USB. 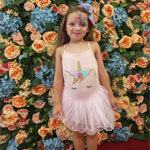 Party Bliss will dress and theme your venue creatively whilst maintaining an attention to detail; a professional service from conception to completion. Contact us for unique ideas and costs. 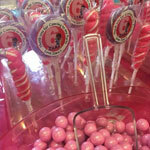 Decorated Sweet Stands and staffed Candyfloss Carts are a treat for big and little guests. Specialist confectionary such as vegetarian, Halal sweets can be supplied at your request. No party is complete without a cake and with Party Bliss you can have your cake and eat it! 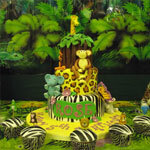 Whatever the occasion our talented cake-designers can create a culinary homemade masterpiece. Simply tell us the shape of cake you require (eg. 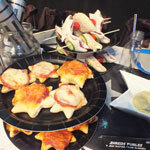 flat, square, round, 3-dimensional), flavour, how many people you are catering for and how much you would like to spend. A beautiful personalised cake along with a list of its ingredients and allergens will then be delivered to your door on your specified day. Prices vary depending on your requirements. A 50% deposit will be required when ordering and the balance will be required on the day of delivery. We offer a choice of plain, coloured or themed tableware. This includes disposable plates, serviettes, confetti, named place cards and tablecloths. 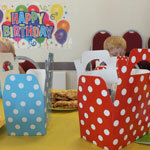 Party boxes and food trays are a great idea as not only do children love them, but they also reduce spillages and mess. You also have the option to serve the party food on rugs on the floor if you do not have enough table space or organise a picnic in the garden (weather permitting!). 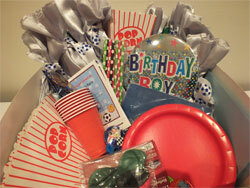 Contact us for a partyware price list. Trying to make sandwiches, jelly and fairy cakes whilst your very excited birthday child wants to open presents, get dressed for his/her party and ‘help’ you bake can be a challenge. So why not let Party Bliss offer that much needed extra pair of hands and provide a party feast to tempt even the fussiest of eaters? Select from a set menu of delicious party snacks or devise your own bespoke menu to suit your taste, party theme or budget and we will arrange freshly-made scrumptious food delivered to your venue. 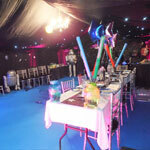 Our experienced catering company can also provide ingenious themed party food ideas and staging. 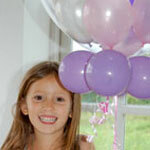 Our catering company specialises in children’s party food but can also offer party platters for adults. Our catering company ensures that food hygiene controls are always adhered to. Ingredient and allergen information is available for all food provided. Contact us for party menu options and prices and to discuss your requirements with a member of our team. 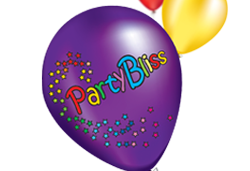 Whether you would like themed helium balloons with co-ordinating ribbons, novelty centrepieces or giant foil or confetti balloons, Party Bliss can deliver them to your venue on the big day. If you want something extra-special such as balloon sculptures or arches Party Bliss has a team of Balloon Specialists who will design stunning decorations at your venue.